It’s a tantalising question Bade Miya faithfuls have often asked: would the seekh kababs and baida rotis have the same bursting tangy (and uniquely Bade Miya) flavour if served in a sit-down, air-conditioned restaurant instead of in tacky cutlery in a dingy bylane of Colaba? They will have the answer in the next few months as Mumbai’s legendary kabab stall is graduating into a restaurant in Fort, south Mumbai, to be followed by branches in suburban Bandra, Juhu and Andheri. Hillary Clinton wanted to sample Bade Miya’s kababs during her Mumbai visit but her security overruled it. If all goes to plan, uniformed waiters will replace the existing crop of chokras, piped music should take the place of car horns and swear words, and freshly washed serviettes will outsmart the ‘mini tissues’ being handed out now. For the 70-year-old Mumbai street-food legend, the transformation from a 10x4 feet steel stall to a restaurant will be a quantum leap. For Bade Miya faithfuls, it will be a moment of near-personal triumph. For many Mumbaikars—and Mumbai aficionados—the restaurant will be yet another testimony to the can-do-will-do metropolis, another rags-to-riches story. “We are planning a sort of barbecue place,” says Mohammed Iftekar Haq in Bambaiyya Hindi, “it’s the logical next level, we should have done it years ago.” He’s one of five brothers, beneficiaries of Bade Miya’s legacy. All of them, as young boys, were witness to their father’s immense popularity and formidable reputation for rolling the best and most succulent seekh kababs this side of the country and for introducing Bombay to baida roti, as the old man often claimed. They follow his routine, starting at 12 noon with sourcing the meat, marinating the meat personally, supervising till the last diner has paid up. The spice-mix continues to be a family secret. The ambience, discomfort, willingness to brave the odds just for that piece of seekh kabab, boti kabab, baida roti, kaleja fry, or simply paneer bhurji with roomali roti all added to the Bade Miya experience. “There was some charm about it. I used to drive down very often,” recalls writer and columnist Anil Dharker. 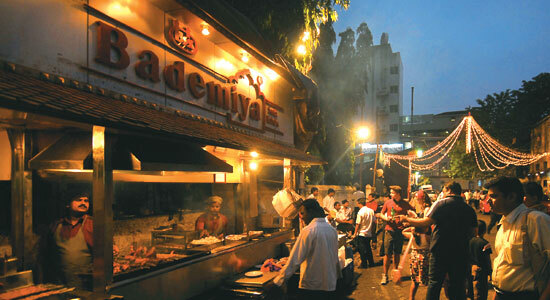 Best-selling author Chetan Bhagat lists Bade Miya as a favourite Mumbai eating-out joint. Even Amitabh Bachchan frequented the stall before “he stopped eating non-vegetarian”, says Iftekar. Art luminary M.F. Husain spent many an evening at the Taj, then slipped out for Bade Miya kababs. “Many famous people come here, or send their drivers with dabbas,” says brother Mohammed Mazhrul. US secretary of state Hillary Clinton, during her Mumbai visit this July, wanted to sample Bade Miya’s food, but her security overruled it. Bade Miya the man was a 17-year-old Mohammed Yaseen when he arrived in then Bombay, from Bijnore, Uttar Pradesh. He did several odd jobs till he met a peer, Hazrat Fida Mohammed Adam Chisti, in 1940, who gave him Rs 20 to set up a kabab counter behind the Taj. 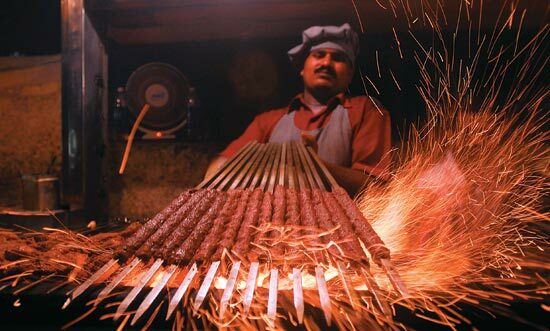 Mohammed Yaseen became a kabab hawker. In time, he came to own a stall. His clientele included the rich and famous of the city, who persuaded the then administration to legalise his street food stall. Other hawkers screamed in protest, but Bade Miya was home. “He would often tell us to treat customers with the utmost reverence. He would say that it’s his customers who had bestowed fame on him,” recalls Mazhrul. Urban folklore has it that Mohammed Yaseen had with time grown a beard, more for want of time than anything else, which led to a few regulars addressing him as Bade Miya. The name stuck. Soon, it became synonymous with Bombay street food. “Uparwale ne naam diya hain, ab hume aage le jaana hain,” Mohammed Iftekar says. The old man passed away nearly 16 years ago. Now his name will adorn a restaurant. In the intervening years, even as the stall was listed in top-of-the-line travel guides, written about in the international media, two developments seemed to take the shine off Bade Miya’s reputation—one, there emerged challengers such as Baghdadi’s and Ayubs; and two, old customers began to crib about the indifferent quality. Some found the earlier charm of the setting wearing off. As Dharker puts it, “Eventually, the smell and hygiene levels came to matter. It was difficult to divorce the context from the food.” The restaurant, Iftekar says, will help bring back this section of the clientele. He is conscious that they must “maintain the standard”. The brothers have shared responsibilities in marketing, general management and kitchen. Bade Miya has rarely downed its shutters in the last 70 years, but on the night of November 26 last year, as bullets rang in the Taj, the brothers simply pushed dining families into open shops and staircases, and fled for their lives, leaving the stall as it were at that moment. They returned two days later, after “pleading with the military that this is our second home”. Even when the restaurants are established, the 10x4 feet stall will stand; it is our foundation, says Mazhrul. This, after all, is where the story began.